Gardening and landscaping may be at a standstill during the coldest, deepest days of winter, but that doesn’t mean there is nothing to enjoy in your yard. In fact, there are many beautiful birds that visit our yards only in winter, including whole flocks of fantastic winter finches. With the right bird feeders and the very best birdseed, plus a few other key winter garden accessories, you can easily enjoy a flock of feathered fun all winter long. Several other northern species, including snow buntings, bohemian waxwings and boreal chickadees may also be seen at feeders more frequently in winter, but it is the finches that are often the most welcome and reliable winter guests – if you have the right birdseed and feeders to attract them. Not in a northern area? 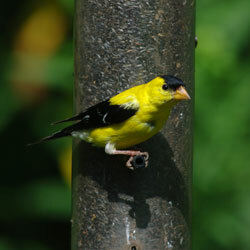 No need to miss out even if the typical winter finches won’t make it to your yard! Many other finches, including house finches, Cassin’s finches, American goldfinches and lesser goldfinches visit more southerly regions in the winter or even stay in the same range year-round, and these tips work just as well for those species. Winter finches eat mostly seeds and grain, and they require great quantities of nutritious food to keep up their body heat and energy in the bitter cold. 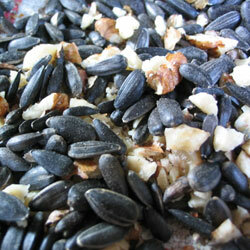 Black oil sunflower seed is ideal for most winter finches, even in southern areas. While their sturdy bills can break open these seeds, hulled sunflower seed is often preferred because there will be no discarded shells to build up under the feeder until the ground can be cleaned in the spring. Offering this seed in open platform feeders will accommodate large, hungry flocks, but hopper or tube feeders with covers will protect the seed better from snow, ice and winter rains that can cause mold. The smaller finches, siskins, redpolls and goldfinches, are especially fond of Nyjer seed, and it is best to offer these tiny, lightweight seeds in small tube feeders or mesh feeders. Metal mesh feeders with small openings are suitable, and these birds will also happily cling to nylon netting sock feeders. Mesh and netting feeders are especially ideal because many small birds can cling to the surface at once, inviting the entire flock to feast together. 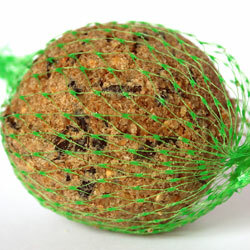 Another fun option is to grow your own birdseed. One of the most popular flowers to grow for birdseed is also one of the easiest – sunflowers. There are many different types of sunflower seeds to choose from, and growing sunflowers is a great family project to introduce young children to gardening. Plant the seeds in a sunny spot or get creative with their placement as an impromptu fence, garden border or even in containers, and enjoy watching them reach for the sun. When the flowers naturally droop and dry, cut them off, hang them upside down and save them to feed finches all winter long – the birds will happily pluck out the seeds from whole heads. The right food and feeders will feed hungry winter finches, but there are several additional accessories you can add to your yard to make it even more finch-friendly. Despite all the snow and ice around in winter, birds need liquid water even more than they need food. Providing a heated bird bath when temperatures drop will give birds a fresh, liquid water source to visit so they don’t need to waste precious calories melting their own water. These birds are used to cold, but extra shelter can make a critical difference in bitter cold snaps, especially further south where dropping temperatures aren’t as common. Bird roost boxes and bird houses can be left up year-round for fast, easy shelter, and dense evergreen plantings also provide a good windbreak and comfortable spot for birds to rest. Bacteria is easily spread through dirty water and bird feces, and clean baths and feeders are essential to keep finches and other backyard birds safe. Use a weak bleach solution to sterilize feeders and baths regularly, and use scrub brushes, old toothbrushes or bottle brushes to get into every nook and cranny. Some bird diseases can also affect humans, so be sure to wear gloves when cleaning. Even the best food and greatest feeders won’t be useful if the feeding areas are buried under ice and snow. A broad, umbrella-style baffle can keep snow off feeders, or you can use a brush or old broom to gently remove snow when needed. Keep a small ground feeding area shoveled or tamped down to make foraging easier for birds under the feeder as well. Winter finches are amazing backyard visitors that aren’t deterred by the cold days, chilly winds and frozen ground that keep gardeners inside for months. By providing good quality food, suitable feeders and other finch-friendly accessories, you can enjoy the energy, color and excitement of these birds in your yard all winter long.